Veuve Clicquot champagne exemplifies chic perfection. 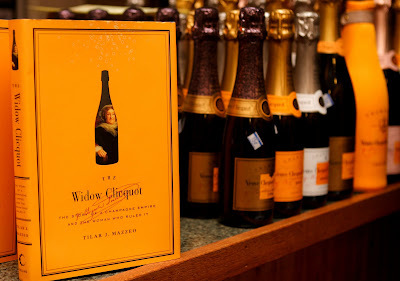 In The Widow Clicquot (Collins Business), Tilar J. Mazzeo helps reveal the intriguing woman who created the unforgettable yellow label: Barbe-Nicole Clicquot Ponsardin. A youthful observer of the theatrical proceedings of the French Revolution and newly widow during the frenzied days of the Napoleonic Wars, Barbe-Nicole resisted customs by steering (after her husband's passing away) the fortune of the wine business they had cultivated. Navigating the business through tumultuous political and economic setbacks, she ultimately became one of the world's first celebrated businesswomen in Europe and one of the most affluent women of her day. Mark and Lynn are pleased to have conducted an email interview with Ms. Mazzeo about her book and the fascinating character at the center of her narrative. M & L: Is the immediate and keen interest you took in Barbe-Nicole Clicquot Ponsardin typical of your personality? TM "I think it probably is. I certainly love Veuve Clicquot champagne and the finer things in life. My next book will be on the history of Chanel No. 5 perfume, so I guess you could say that I am drawn to writing about luxury products. And I am a pretty devoted Francophile too." M & L: In your opionon is BNCP a great figure in wine-making, a great figure as a business pioneer or a great figure for her countrymen? TM: "I think she's inspiring for all those reasons. Her technical innovations in the cellars are a good part of the reason champagne became something in reach of the affluent middle classes, rather than just the drink of the aristocracy. At the same time, she was the first woman in history to rule over an international commercial empire. And in France, she remains a folk hero." M & L: You expose a couple of myths about Champagne including the idea that Dom Perrignon "invented" the stuff. Was there anything you found particularly odd or interesting in writing your book? TM: "For me the best part of doing the research for the book was trawling through the old historical archives in France, where I learned all sorts of interesting things about what it was like to be a wine maker and a woman in the years after the French Revolution. The Widow Clicquot's intensely competitive relationship with her famous arch-rival Jean-Remy Moet was fascinating. And, of course, the wine tasting "research" was something I was particularly interested in!" M & L: How did you like writing elements of a thriller in this work? TM:" Really the Widow Clicquot's story has such inherent drama in it--her astonishing rise to world fame, the risks she took, the foolish missteps she made that almost lost her everything--that it was easy to write a fast-paced story. I had a great time writing this book." M & L: Is there anything you left out of this book that you wish you had put in? TM: "Well, I wish in retrospect that I had written a bit more about the Widow Clicquot's role in inventing what we now think of as wine tourism. At the end of her life, she became one of France's most celebrated tourist attractions, and the open door policy at her chateau helped establish wine tourism as a mode of traveling. But this wasn't something I really began investigating in detail until after the book was already in production." M & L: Does it feel different to taste VC having written this? TM: "I think with tasting wine, knowing more about it always gives you a greater appreciation for its characteristics. You refine your palate by learning as much as by tasting. And I love the fact that I can look at a yellow bottle of the classic Veuve Clicquot N.V. and know the history of how the bottle was designed historically."